On August 25th, a construction crew working on a new Public Safety Facility for police and fire services in Thornton, in the metropolitan area of Denver, Colorado, stumbled across the remains of one of the top 5 favorite dinosaurs of every child who just got his first dinosaur book: a Triceratops. Dan Wagner, a construction inspector with Terracon Consultants, made the first discovery. It was just a small piece of brownish bone but he wisely investigated further. He swept the area and found more of the bone embedded in the soil. When he had uncovered enough to see that this one bone was about four inches wide, he realized it had to be a dinosaur fossil. 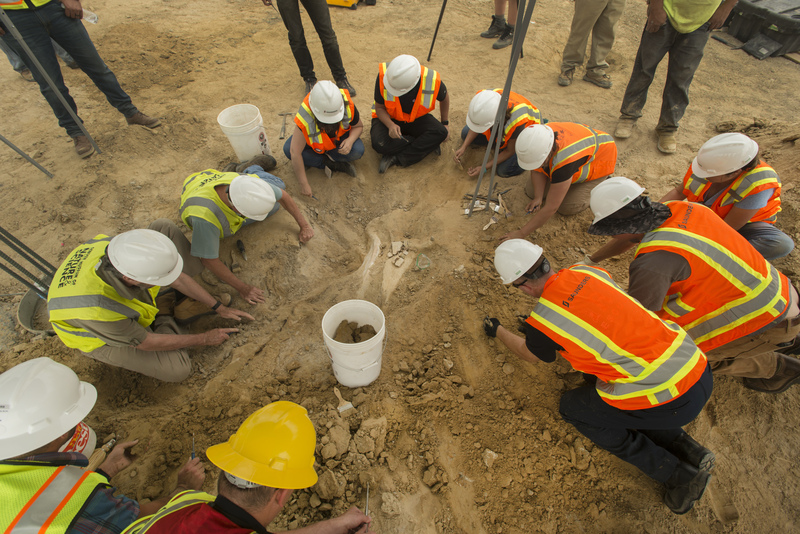 A team of paleontologists and volunteers from the Denver Museum of Nature & Science (DMNS) excavated the fossil at the construction site. The excavation quickly yielded results. By August 29th, they’d unearthed a horn and a shoulder blade. The next day a second horn made its appearance, as did a piece of the frill, the lower jaw beak, a few ribs and vertebrae. As of September 1st, the bone count was up to 12. 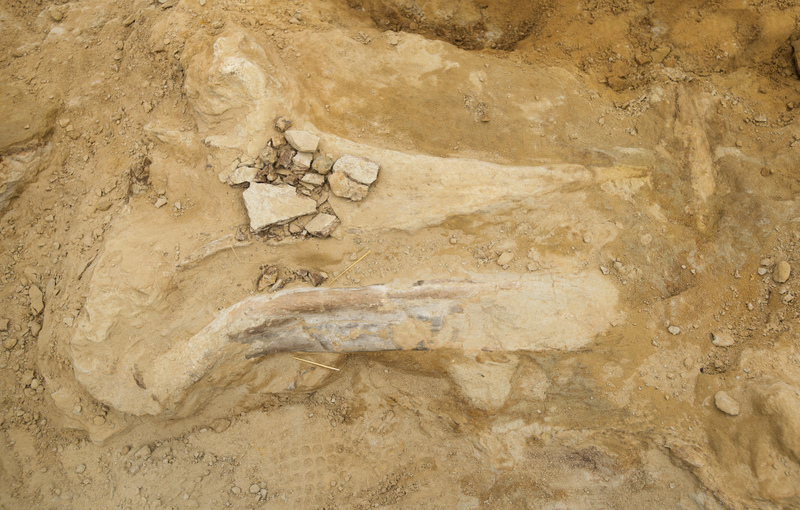 The first bone to be fully excavated and removed from the site was a rib bone that weighs 40 pounds. Extrapolating from the size of the bones, Sertich estimates the Thornton Triceratops was rather petite, approximately the size of a rhino. Triceratops fossils discovered in Montana and North and South Dakota were notably larger than the Denver fellow, about the size of a medium elephant. Because of its location on the K-Pg (Cretaceous–Paleogene) boundary — a thin geological stratum that marks the end of the Cretaceous Period and the beginning of the Paleogene Period — Denver sits atop a wealth of paleontological remains. There was a mass extinction event during this transition, one that took out all of the dinosaurs (except for the birdlike ones), so digging underneath the boundary in Denver can reveal a variety of fossils from the late Cretaceous, around 66 million years ago. 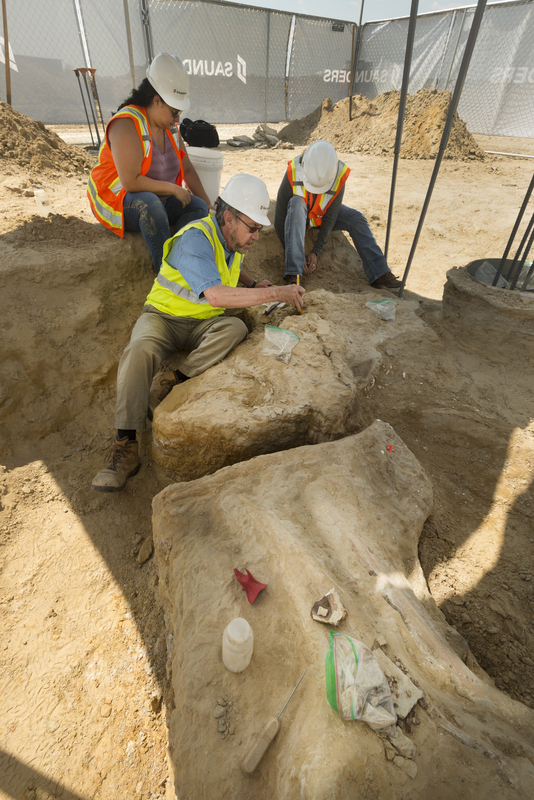 Because Denver is so extensively built over, it’s not often that paleontologists have the opportunity to excavate below the boundary layer, and when they do, most of what they find are plant fossils; large animals like dinosaurs are rare finds in the Denver area. Dr. Sertich believes this Triceratops is one of the most important finds of the decade in Colorado. This wouldn’t have been possible if it weren’t for the conscientiousness and immediate response of the construction crew. The excavation is ongoing even as construction continues at the secure site. When a bone is fully excavated, the team covers it in a plaster jacket so that it will be protected during transportation to the Denver Museum of Nature & Science. Once safely in the care of the museum’s the paleontology lab, the plaster is cracked open like a cast and study and conservation of the bone begins. The conservation lab is behind glass in the museum’s Prehistoric Journey exhibition, so visitors will be able to view the Triceratops fossils at various stages in the process. Teachers, the museum will be hosting a two-way interactive webinar for classrooms grades 4-12 on Tuesday, 9:30 AM Mountain time. Registration and your basic desktop computer setup with internet access are required. Register here for a unique opportunity to hear about this exciting find from Joe Sertich himself, ask him questions and generally spend the early hour of the school day doing something awesome. The rest of us will have to make do with a Facebook Live update about the Thornton Triceratops on the DMNS page Tuesday at 9:30 AM. This video has no commentary or background music or anything extraneous whatsoever. Only close views of the excavation accompanied by ambient sounds, not even explanatory interjections from the experts. This is so exceedingly rare I must take a moment to thanks the Denver Museum of Nature & Science for trusting in the raw material being fascinating to anyone who would watch videos like this in the first place. Keep your eyes peeled for a magical moment of whimsy starting at the 2:04 mark. This entry was posted on Sunday, September 3rd, 2017 at 11:52 PM	and is filed under Ancient, Museums. You can follow any responses to this entry through the RSS 2.0 feed. You can skip to the end and leave a response. Pinging is currently not allowed. My 5yo just watched the video with me, rapt attention the whole time.